Regular readers know that I have long advocated that lawyers should accept the use of credit cards in payment for fees. We must make it as easy as possible for clients to pay for legal services. Clients today live on plastic, so paying legal bills with credit cards is easier for them. This creates a tremendous marketing advantage for the lawyer, not to mention the ease and assurance of payment and the speed of collection. However, accepting credit cards is neither problem nor risk free. One notable issue can be the administrative charge that the credit card companies make to the lawyer who accepts cards in payment. As with other merchants, lawyers have the right to raise their fees across the board by 1% to 2% to make up the difference, even for clients who do not pay with plastic; the uniform increase is essential, because some jurisdictions prohibit charging clients differently solely on the means of payment. An alternative is to keep your fee as is and add an "administrative charge" equal to the merchant fee percentage, similar to additional charges for photocopying or faxing. Of course, many clients do not accept that law firms, unlike other businesses, do not absorb such fees as a cost of doing business. If your competitor firms do not make such ancillary charges, think twice about doing so yourself. A second problem/risk is the potential for a fee dispute after the engagement with a disgruntled client who has already paid by credit card. To avoid problems, secure the client's agreement that no dispute with the law firm will be raised with or adjudicated by the credit card company. In other words, the client agrees that the charge is non-refundable and cannot be reversed by the credit card company. Any dispute over fees paid by credit card should be settled between the lawyer and the client, governed by the rules of professional conduct. It would be wise to call your merchant account holder or the credit card company to confirm that the language you use will be accepted by them to prevent a chargeback and support the merchant over the credit card holder. There might be a temporary "hold" until they can get the story from both sides, but with proper language the card service providers should back you up. Of course, when you talk to them, get the name/position of the person contacted and date/time of discussion and keep it on record - it's best not to be too trusting when it comes to getting paid! This week, I'm again "on the road." I went to Sarasota, FL where I offered a complimentary breakfast for local lawyers. It was cold, colder than home and colder than I expected from Florida. I actually wore my overcoat! Then, I went to New York. They were just recovering from a major snow dump. Got to see two of my eleven grandchildren - cute as a bug in a rug - except sledding in the snow, not the rug. From there, it was on to the LegalTech show in Manhattan. 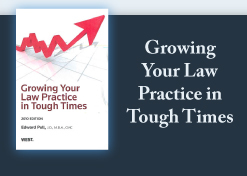 See my preliminary thoughts at LawBiz® Blog.